The building is open 24/7. Full range of services available Monday – Friday 9:00–17:00, limited service at other times. Your University card is also your library card and will be given to you at your faculty induction session. You must bring your card to access the library building, borrow items, print and purchase materials. Replacement cards can be ordered online via the University of Plymouth eStore or from the Card Office – located in the Roland Levinsky Building. Is there free WiFi in the library? Yes – and right across campus. The WiFi service is called Eduroam and you connect with your University username and password. View more information and connection instructions. Are there PCs I can use? Can I bring my own laptop in? Yes – there are plenty of power sockets. The University of Plymouth offers students software packages for installing on your own device. A full list of available software can be found by on the Work at Home site. Microsoft Office 365 is available to University students as a free download. My University computing login isn't working. For password resets call library and IT enquiries on +44 1752 588588 or change your password online. Where can I get library and computing help? 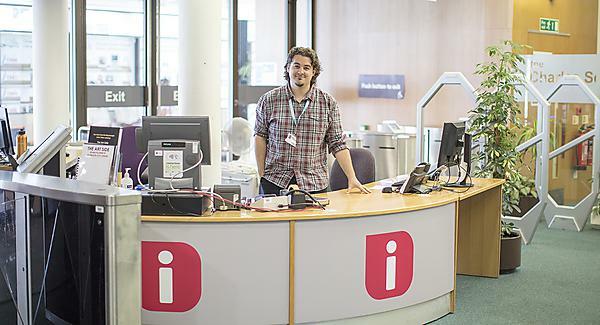 Library staff in the Digital Advice Zone on Level 1 of the Library can assist with software support, WiFi connection, printing, and account queries including password resets. Monday – Friday, 10:00–18:00. Library staff in the Open Access computing room on Level 1 of the Babbage Building offer the same support Monday – Friday, 10:00–14:00. Or you can log a computing issue with IT Self Service. Your Library Information Specialist can help with subject specific enquiries. There is a wealth of online help and support available at LibGuides and Self Help. Yes – and the printers can also be used to scan documents and save them to your email or OneDrive. Large format printing A2 £4, A1 £6, A0 £8. How do I top up my University card? Top up online with a debit or credit card – it’s quick and secure. We recommend that you use Chrome as your browser to access this page. Or swipe your University card at one of the money loaders and insert coins. Can I bind my work? Yes – binding materials are sold at Library Reception during core hours, binding machines are available for self-service use 24/7. Full price list of stock available at: Library and IT Self Help Article - Supplies. How do I find a book or article? The library provides access to approximately 350,000 books and e-books, multimedia items and 14,000 current journal subscriptions – both physical and electronic. Search via Primo the Library catalogue. This video shows you how to find a book: How to find a book DLE video. Students and staff can borrow 20 at a time. Initial Teacher Education (ITE) students can borrow an additional 40 from the School Experience Collection. The loan period is six weeks; you may renew books at any time while they are on loan to you unless they are recalled by another student. If an item is recalled you will be asked to return it within seven days, or by the existing due date, whichever is sooner. You can renew your books via Primo the Library catalogue. My book has been recalled, what do I do? If someone recalls an item you have on loan, you will be asked to return it within seven days (or by the existing due date, whichever is sooner) including during vacations. You will not be able to renew recalled books. Will I be charged a fine if my book is overdue? Fines are only chargeable on overdue recalled items, for more information read Library and IT Self Help Article - Recalls. At Library Reception on Level 1 of the library with a debit or credit card or with credit loaded on your University card. Or by phone +44 1752 588588 with a debit or credit card. Do I need to be silent in the library? Unless you are in an area designated as a quiet or silent space for individual study, a low level of noise is acceptable. Phones should be switched to silent mode. Where can I study with my group? The library has a variety of different study spaces to suit individual needs, as well as bookable rooms, there are flexible spaces suitable for group study. Some areas are equipped with PCs and you are welcome to bring your charger and plug your device in whilst you are studying. How do I book a private study room? You can use the library study room booking system. Find more information on how to use the booking system at Library and IT Self Help Article - Study Rooms. You can consume cold snacks and hot or cold covered drinks in the library. Hot food is not allowed. There is a café on Level 1 open Monday – Friday and vending machines and water fountains are also available. Please report any spillages to library staff and place your rubbish in the bins. I've lost an item in the library, what should I do? Please ask at the Information Desk if you have lost anything in the library building. Clothing, files, etc, will be kept in the library for a maximum of 28 days.